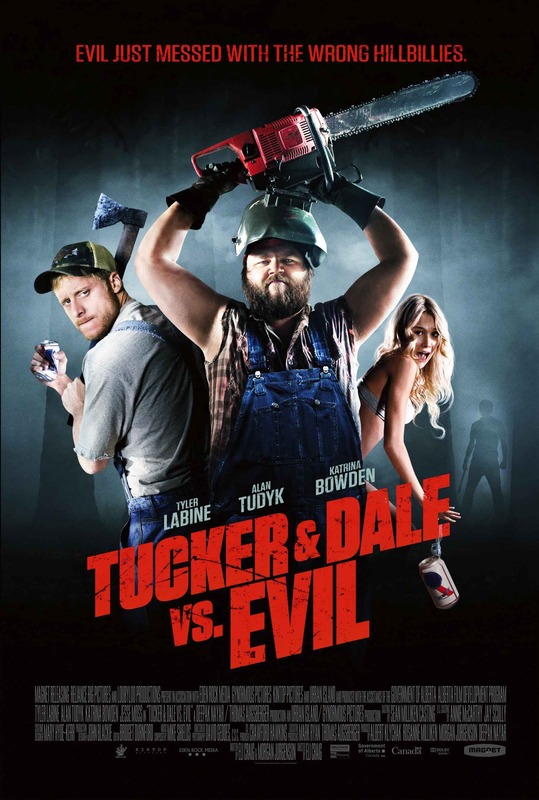 Tucker and Dale vs Evil (2010) | 'TAIN'T THE MEAT… IT'S THE HUMANITY! The horror-comedy Tucker and Dale vs Evil takes one of the quintessential tropes of horror cinema – a group of pretty college students chased and terrorised by blood thirsty hillbillies – and neatly turns it on its head. Tucker and Dale, charmingly played by Alan Tudyk (Firefly) and Tyler Labine (Reaper), are kind-hearted and innocent red-neck friends who travel to the Appalachian Mountains to work on Tuckers new holiday residence, a proverbial cabin in the woods. Along the way they encounter a group of college students who, thanks to the influence of countless horror films, believe the two friends to be pitiless, blood-thirsty killers. The misunderstandings mount as several of the students, through their own stupidity, accidentally kill themselves and the rest of the group blame the hapless friends who are then forced to defend themselves when the students attack. Throw in a rather dim sheriff and a neat twist on the ‘dumb blond’ character and you have a film that pays homage to the horror genre while gently poking fun at it. The Texas Chainsaw Massacre, Evil Dead’s 1 and 2 and The Hills Have Eyes, amongst others, are all referenced to marvellous effect. The scene where Tucker accidentally cuts through a beehive with a chainsaw mimics one of The Texas Chainsaw Massacre’s most memorable scenes and is genuinely very funny. As is the scene towards the finale were Dale armours-up, clearly a nod towards the ‘groovy’ scene from Evil Dead 2. (Sharp eyed viewers will also spot that the duo’s favourite beer is Pabst Blue Ribbon, the drink of choice for Blue Velvet villain Frank Booth). The film-makers are clearly fans of the genre so even though the comedy is deferential the film doesn’t shy away from the gore – as the film progress the clueless students kill themselves, and each other, in increasingly more gruesome ways. The scene were one unfortunate student throws himself into a wood chipper is both bloody and hilarious. What really holds the film together though is the relationship between the two friends: Tucker and Dale have grown up together and their friendship is very believable – you care about these characters which makes their jeopardy all the more real. Although the film was made on a modest budget it really doesn’t show on screen. The outdoor woods scenes, shot with the ubiquitous eerie mist, are beautifully photographed and although the movie clearly pays homage to it’s B-Movie roots that doesn’t mean it’s cheap or tacky. Although the film didn’t fare well at the box-office, due mainly to its limited theatrical release, it has subsequently become a fan favourite on DVD and Blu-ray. Tucker and Dale vs Evil may not have the larger budget of Cabin in the Woods or sport a clever genre-busting Joss Whedon script, but it does succeed as both a send-up and celebration of horror/slasher films and it’s a great deal of fun.